Fourty-three readers love this post. DrinkWire is Liquor.com's showcase for the best articles, recipe and reviews from the web's top writers and bloggers. 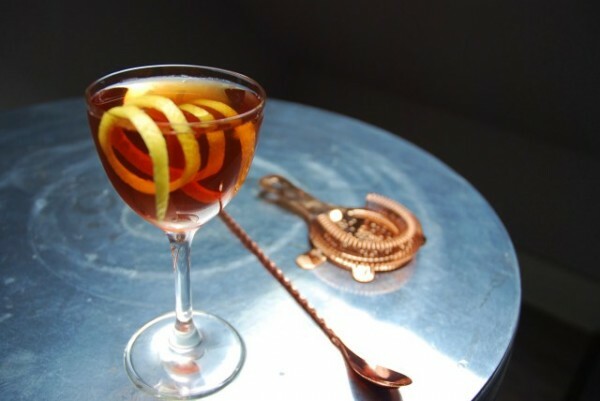 In this post, Just Cocktails offers a cocktail recipe based on history. Drinking on the Hindenburg. Smithsonian Museum. The hydrogen-powered Hindenburg was a notable accomplishment even in an era when humanity’s technological advances were on overdrive. It’s also a history that can feel weird to research from a cocktail archaeology perspective – given that the giant blimp flew from Nazi-controlled Germany. The Zeppelin Company Chairman Eckener didn’t want his flights politicized for Nazi propaganda, a stance that got him very publicly chastised by the Nazis. Prior to the first Zeppelin transatlantic flight in 1936, the Associated Press discovered that Nazi Propaganda Minister Joseph Goebbels had decreed that Eckener’s name could not be mentioned in German media. He stated, “no pictures nor articles about him shall be printed.” Eckener was then demoted to the role of ‘supervisor’ of the first flight to Rio. The lounge of the Hindenburg was 34 feet long, along the starboard side of the Zeppelin. Pictures show that the lounge wall bore a huge Mercator projection of the world. With the key voyages of explorers such as Columbus, de Gama, Magellan and Captain Cook. The starboard side of the ship also contained a 12-by-15-foot hermetically sealed smoking room. One gained entrance through a double door air-lock. The room was kept at a higher air-pressure to prevent the flammable hydrogen from coming in. This sounds foolhardy, at best. The duty of the bartender was to ensure that guests' smokes were lit ONLY with an electric lighter. They’d also inspect that no one left the smoking room to reënter the bar with a lit cigar or cigarette. It was the job of the elevator man to keep the ship inclined 5 degrees to ensure wine bottles didn’t tumble off tables. The lounge had a custom-made Blüthner piano, the first piano used in flight. Built with aluminum to restrict its weight to 397 pounds, a 220-pound savings from a similar sized piano with cast iron parts. The Hindenburg removed the piano in 1937 to save more weight, so the instrument survived the crash only to be later destroyed in a bombing. 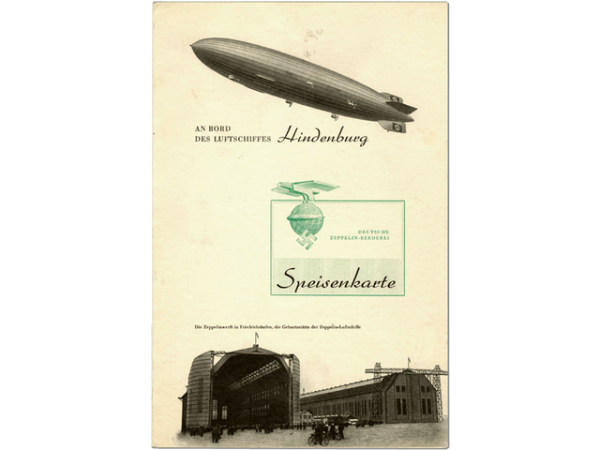 Front Cover Hindenburg Wine Menu. Image credit: The Smithsonian Museum. 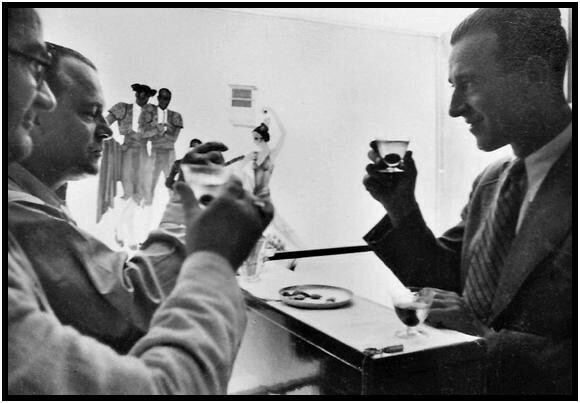 On one flight, the guests consumed all the available whiskey on board, and so the Hindenburg’s signature Kirsch Martini (3 parts kirsch, 1 part dry vermouth, dash of grenadine) was hatched. Stirred and strained. Served with a lemon twist. Hindenburg Cocktail Shaker recovered from the wreckage of its botched final landing in New Jersey. Image credit John Connor. Worth $13.000 in auction.